Bulgarian uniformed police officers are earning money on the side by working as thugs in the rampant mafia wars on the southern Black Sea coast. After completing their regular shifts, employees of the Ministry of Interior in the Burgas Region take off their uniforms and grab the clubs. They are willing to breach all laws for some money and especially the one law they ought to respect the most – the Ministry of Interior Act. 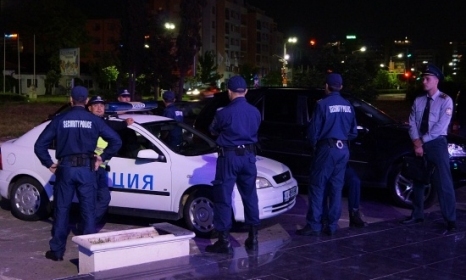 According to information from Bivol insider sources, the bargaining between organized crime and police officers is taking place in popular nightclubs on the seaside and policemen are joining the thug brigades dealing with beatings and arson south of the coastal town of Sozopol. These repeats of the “early 1990’s” mafia wars are said to be waged now between the power structures and security companies of oligarch Nikolay Banev and those of Dimitar “the Karate Kid” Spasov. Both, during the term of the previous government as well as under the present one, the police are keeping a blind eye, officially concealing the problem, and letting the two mafia armies do their deeds unpunished and all over the place, causing serious suspicions of corruption all the way to the highest places in the Interior Ministry. The tariff to hire a cop as a private thug averages around BGN 100 a day. It is much lower than the wages of the prostitutes on the coast, who make the same money in an hour; nevertheless, Bulgarian police employees are more than willing to cross the line between law and crime against some cash. The criminal activity of the police officers is well-known to their superiors, to the leadership of the Burgas Border Police, but it is being concealed as corruption rages throughout the entire system. One year ago, Bivol published an investigation into the fact that during their regular work shifts uniformed police officers in the country’s largest summer resort “Sunny Beach” earn additional income as drug dealers. We quoted specific details, names and police records (see here ). The information was not disproved, but the records were concealed by the prosecution, while police and criminals together continue to act as racketeering gangs in the resort. The lack of any adequate response by the government to this outrage has turned police crime to a widespread occurrence along the entire coast. Bivol learned from its own sources that in addition to “Sunny Beach”, police officers are now managing the distribution of illegal drugs in the Sozopol area, and their activity is controlled by former and current bosses in the Interior Ministry. An independent investigation can prove and confirm everything, but there is no one in the Mafia state to conduct it, say off-the-record the non-corrupt employees, who know all the details but do not dare to reveal them for fear of repression against them and their families. Hot noon at the “Kavatsi” campsite at the end of June – stunned tourists are witnessing a mass scuffle between tattooed thugs from Dimitar Spasov’s gang and Nikolay Banev’s guards. After being officially alerted, the Sozopol police finally interfered and stopped the live action. Ten individuals with criminal records were taken into custody (their names are kept in the editorial office). It was established that those arrested were employees of two security companies – Spasov’s and Banev’s. However, the press center of the District Police Directorate of the Interior Ministry claimed before the media that all this is rumors and there was only a slight altercation over an unpaid bill between two friendly companies. There were no disturbances in the campsite and the holidaymakers have been relaxing undisturbed. The incident, nonetheless, was blown up before the media and on Facebook by Banev himself, who was abroad at that time: “What can I do?! Shall I call a couple of Donetsk and Lugansk thugs to deal with “the Karate Kid”?! He does so, but I do not,” commented the oligarch. Banev and his thugs then occupied one of the bars on the beach where the oligarch had to meet with “the Karate Kid”. But the police were warned that the meeting may turn into a clash. They went to the campsite and collected ID cards. This is how it was established that employees of the Ministry of Interior were part of the group of guards with criminal records. It turns out that, as a true patriot, Banev did not call thugs from Donetsk and Lugansk, but turned instead to police officers from Burgas and from Border Police. For BGN 100 a day, they had the task of enforce “respect” during the meeting with his rival. This has been acknowledged by the police officers themselves in written explanations that their colleagues requested from them after taking them to the police precinct. During the interrogation it became clear that the police officers were recruited by guards with whom they trained together and/or visited the same Burgas night clubs. Their motive was earning some quick cash. A logical consequence should be to immediately suspend temporarily from work the involved police employees; to conduct an internal probe; to inform the District Prosecutor’s Office and launch pre-trial proceedings. Nothing like that is happening at the moment, weeks after the cops-thugs were busted. These same cops continue to work their shifts. The prosecutor’s press office told Bivol that the Burgas Regional Prosecutor’s Office had not been notified by the Interior Ministry that employees of the institution have been caught carrying out unlawful security activities in the company of people with criminal records. The Ministry’s press office declined comment, justifying it with the short deadline before the publication, but promised a probe. They insisted, however, that the questions be asked according to the Access to Public Information Act (APIA), which means that the answers will be received in 14 days, at the earliest. Bivol did sent questions under the APIA to the Minister of Interior Valentin Radev and Prime Minister Boyko Borisov. Not that we expect adequate answers, but we respect the law and the ethical rules of journalism. So far the southern Black Sea coast action games have gone without murders and shootouts, like last year in “Sunny Beach”. Bivol then reported that the thugs who fought for territory were under the auspices of police chiefs. Against the backdrop of these terrible facts, circumstances, and corrupt practices of seaside policing at the height of the tourist season, the current police protests, demanding higher pay and better conditions, seem more than cynical. Moreover, the Bulgarian police are one of the few who are privileged to receive a full amount of retirement pension and salary at the same time after their retirement. This makes roughly about BGN 2,500 a month from the State budget for a policeman who has retired but continues to work – an absolutely unprecedented phenomenon against the backdrop of mass poverty. Even Bulgarian mothers do not have similar privileges as when they return to work their motherhood social benefits are taken away. Bulgaria, however, is known for the biggest demographic collapse and the highest number of police per capita in Europe. Anyone still living in the country can make their own conclusion about the existing level of crime and the state of the rule of law.